An installation commemorating the 100-year anniversary of the end of World War I has opened in London. Called "Beyond the Deepening Shadow: The Tower Remembers" and featuring approximately 10,000 torches, each illuminated every evening by more than 250 volunteers, is an act of remembrance for the lives lost during the war. “The flame is an act of commemoration, but also it’s hope for a peaceful world,” Tom Piper, the designer of the installation, told ABC News. 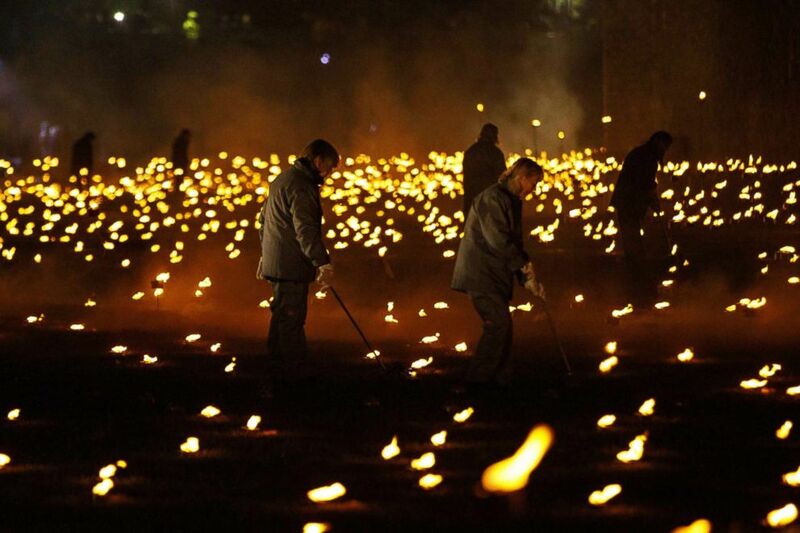 The moat of the Tower of London are seen filled with thousands of lit torches as part of the installation "Beyond the Deepening Shadow," in London, Nov. 4, 2018. Tom Piper told ABC News that he wanted to bring light to counteract the period of great darkness during World War I. "It is important for us to ensure that those who lived, served, fought and died during this time continue to be remembered, and that the lessons from these conflicts continue to be shared," Lord Houghton, constable of the Tower of London, said in a statement. 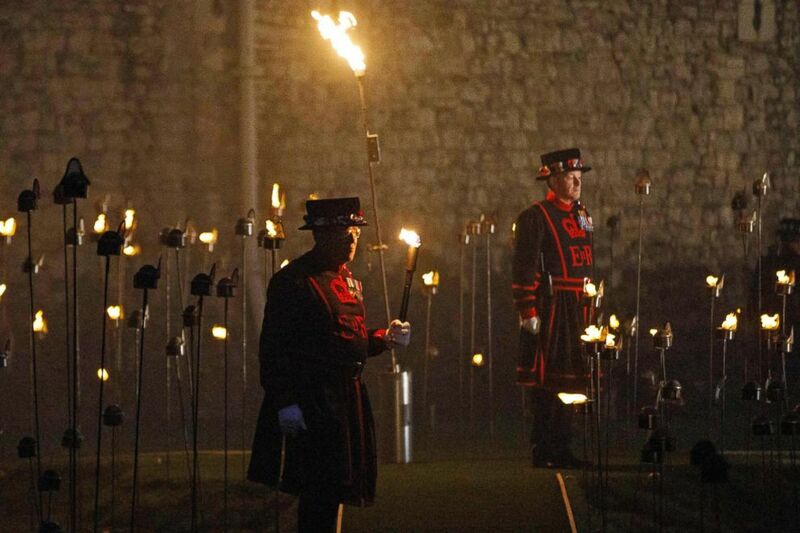 A Yeoman of the Guard stands among lit torches that are part of the installation "Beyond the Deepening Shadow" at the Tower of London, in London, Nov. 4, 2018. "Beyond the Deepening Shadow" also features a sound installation, inspired by war poet Mary Borden's work, "Sonnets to a Soldier," which includes a choir. The idea behind the complete installation is to create a space for reflection, said Eva Koch-Schulte, creative producer at the Historic Royal Palaces, the charity that commissioned the installation. 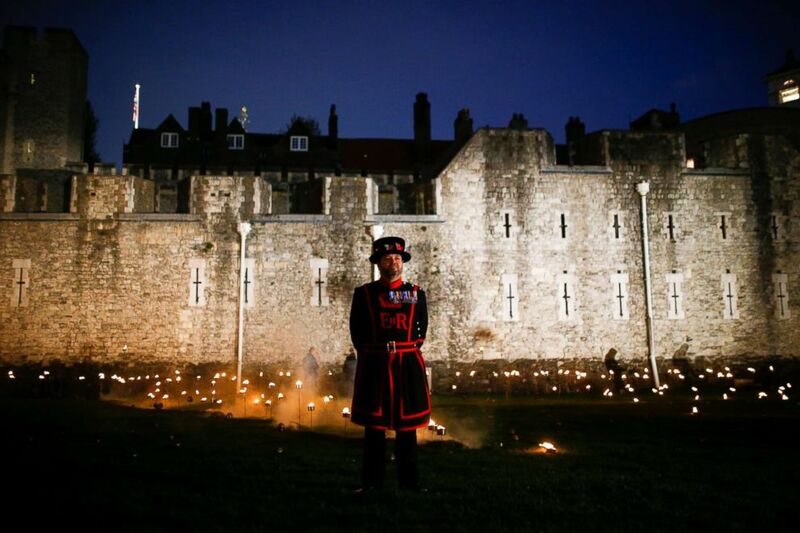 Yeoman Warders, commonly known as a "Beefeaters," stand by after lighting the first of thousands of flames in a lighting ceremony at the Tower of London, Nov. 4, 2018. 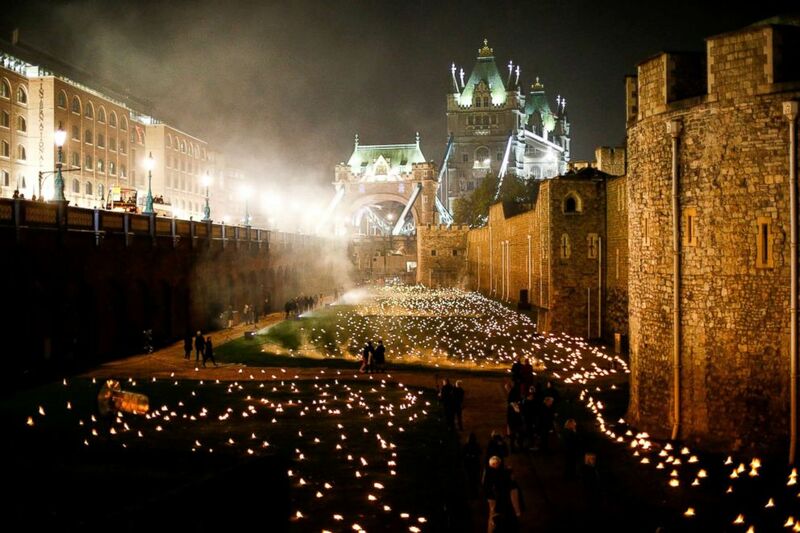 People light thousands of flames in a lighting ceremony at the Tower of London, Nov. 4, 2018, as part of an installation called "Beyond the Deepening Shadow: The Tower Remembers," marking the end of the First World War. "There's a need out there for shared spaces to enable shared remembrance -- for creating a space where grief is OK," Koch-Schulte told ABC News. "That's what we hope this will be, something that touches people through beauty, that allows people to have a shared experience. The installation will run from Nov. 4 until Armistice Day on Nov. 11.